Out-of-box machines now-a-days are coming with a recovery partition. 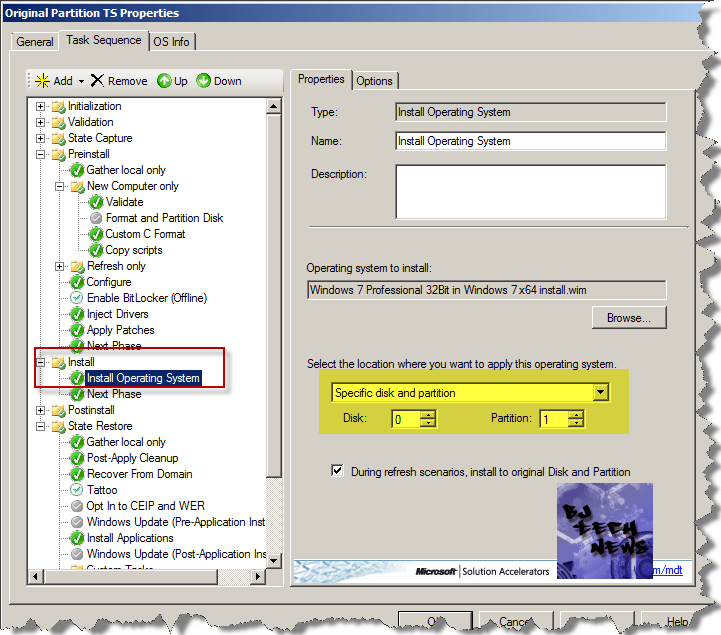 If you are using MDT 2012 to deploy your Windows 7 image, the Task Sequence will format the partition and you will lose that recovery partition. 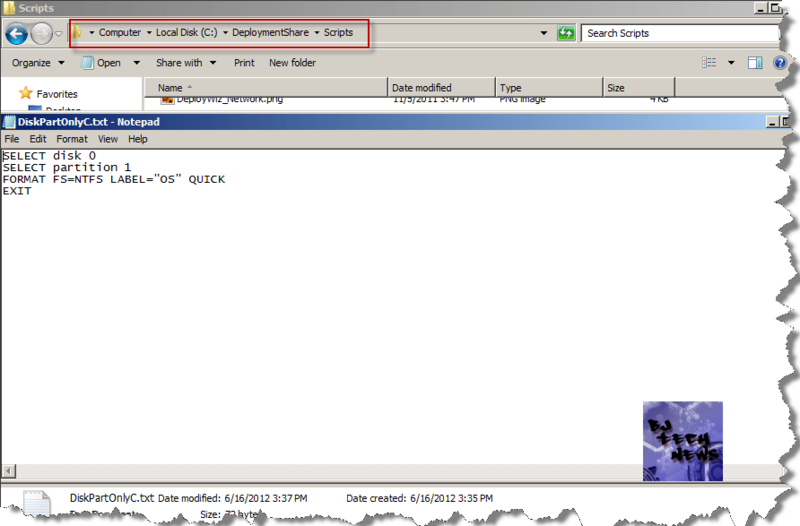 Modifying the Task Sequence to keep the recovery partition and then deploy your Windows 7 image. If the post was helpful. Please take the time to +1 it, comment or rate it. Thank you. Retourn Code = -2147467259 0x80004005″. I do not why, so I did as blog show. Could anyone help me with this error please? how to do this with GPT partition style ? Are you referring to – when you are in the deployment environment? first I want to thank you for your input with WDS and MDT are very useful and helped me a lot. 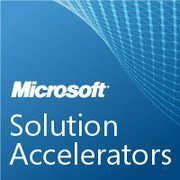 I am new in this field and implementing mdt and wds in my company I was wondering if there is any way to have a graphical interface to partition and format hard drives. Are you referring during the deployment process? Thanks to your tip, worked like a charm!! 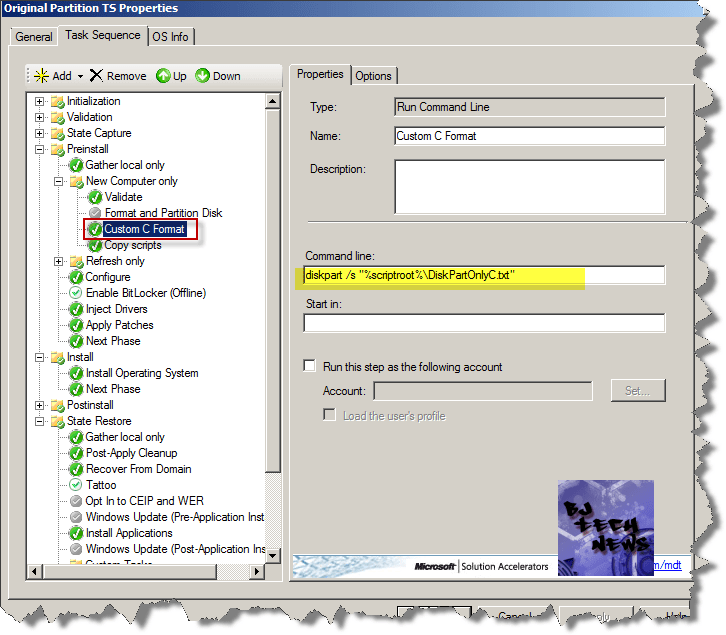 Observed that just disabling the “Format and Partition Disk” sequence step & specifying Destination: disk and partition as above would delete all the contents(files, folders according to BDD.log) of C drive alone MDT Deployment… However It takes about 4 mins to delete all thousands of files in OS partition. But, It fails if in the scenario of “New computer”. Of course It do fails…but Is it possible to put IF CONDITION or similar to proceed further if the disk is not partitioned or New disk as I’ve automated the single “captured” Task sequence. Welcome if you come up with any ideas…. I was just thinking. Isn’t disk 0 partition 1 usually the smaller (around 100mb or so) system partition that windows 7 creates? I just checked a computer I was testing this on and it has 3 partitions on disk 0. And partition 3 is my D: drive that I want to keep intact. can you take a screen shot of you setup and the outcome of it. You should have only two partitions. Which is strange. You can place the screenshot in my tech forum (http://bjtechnews.the-talk.net). Bit outdated but right now I’m testing this on Lenovo systems which only have the 2 partitions like mentioned but we do a lot of HP imaging as well so trying to get a handle on the potential issues ahead of time. I’m just curious, did you make sure to change it to part 2 in BOTH the text file and the install OS in the task sequence and still run into this? I doubt you’re monitoring this still but figured I’d ask. I have to take a look at this. I haven’t touch base on this topic for awhile. Don’t remember what I did. Normally, the deployments I have been doing is formatting the drive and re-creating one partition for the OS. I started looking into doing an update version with this topic, but got side track with other projects. i have followed this option which is almost working…but during installation i get the following error : “Unable to find the SMS Task Sequencer. The deployment will not proceed”. How to fix this? 1. You are deploying a custom image that contains an “_SMSTaskSequence” or “MININT” folder within the image. Please make sure not to use the answer file to partition disk 0. We need to let BDD/MDT use the default ZTIdiskpart.txt file. I suggest you clean up leftover files manually from the process. That may be occurring and causing the errors.